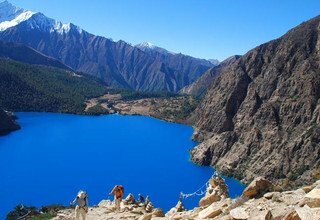 Dolpo Jomsom Trek traverses Musi Khola and Jungben La is one of the most audacious treks in the Nepal Himalayas that moves through truly off-the-beaten trails connecting Dolpo with Annapurna region. 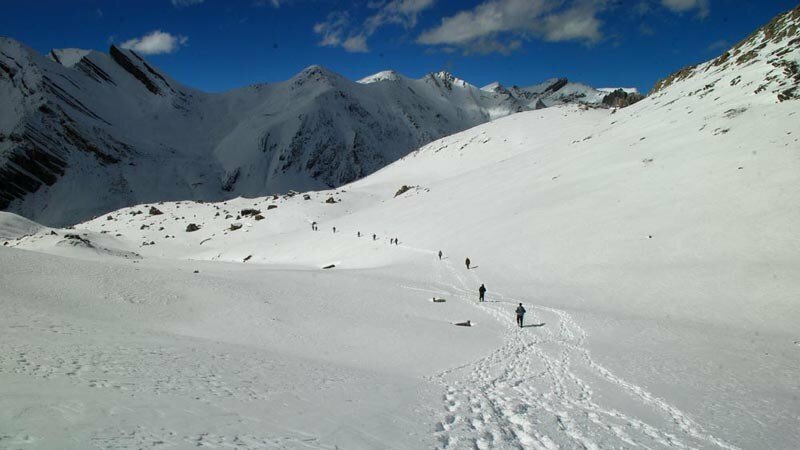 This trek is ideal for thrill seekers who do not mind getting lost in the wilderness of the Himalayas as the trails are quite, and sometimes without human settlements. The trails are untouched and unspoiled thus you can get a firsthand experience of trekking in the remote areas on the foot of the Dhaulagiri massif. 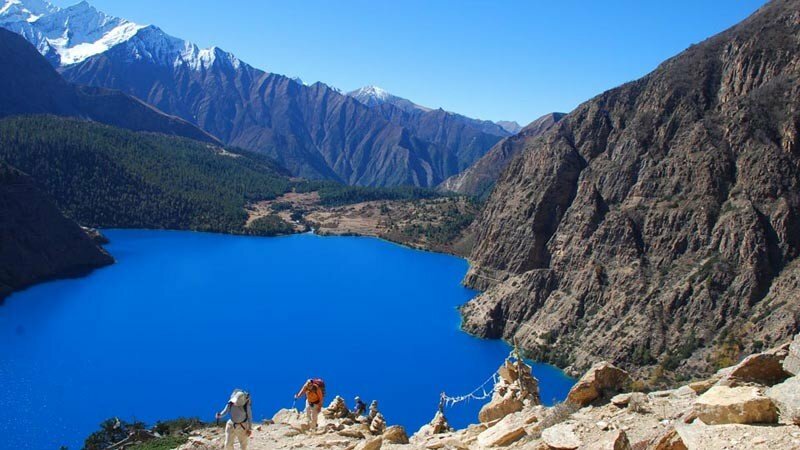 Dolpo Jomsom Trek starts with your arrival in Tribhuvan International Airport, Kathmandu, from where you first fly to Nepalgunj and then take a scenic flight along the Himalayan range to Juphal, the administrative office of Dolpo. The trail takes you past vast and rugged landscapes, fortified villages, ancient monasteries, and Chortens. The villages like Kakkot and Mukot are untouched and are visited by only a few outsiders. The quite trails take you through deep forests, wide meadows, rocky paths, and moraines, giving you an exhilarating experience. Walking past the grazing area of Yak Kharka, you reach Niwas High Camp, where you can find yourself surrounded by sparkling mountains from all sides. Up ahead are two high passes Niwas La (5120m) and Jungben La (5550m). The views of the Dolpo region and the Himalayan ranges, including Annapurna and Dhaulagiri massifs, seen from these high passes are absolutely stunning. The latter part of the trek takes you into the quiet paths of Kali Gandaki valley, contrary to the popular route alongside the river. The trek comes to an end as you make your way through the forest to reach Jomsom. 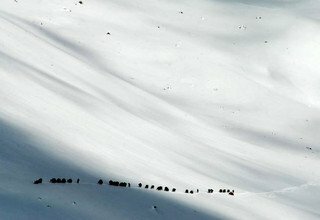 Swiss Family Treks and Expedition is a reputed company in the travel and tourism sector in Nepal. We take care of your transportation, permits, accommodation and every other travel necessities. We provide you high-quality tents and healthy food and assure you top quality of service. Our experienced and friendly guides, porters, and cooks work together to make your travel a pleasing experience. Traveling with us will give you an experience of a lifetime. Upon your arrival in Kathmandu, our company representative will welcome you at the airport. Then you will be transferred to the hotel for your overnight stay. You take a scenic flight over the hills and the plains of western Nepal to reach Nepalgunj. The city of Nepalgunj lies on the Nepal-India border and is the hottest city of Nepal. Upon arrival, our company representative in Nepalgunj will take you to the hotel in a private vehicle. After some rest, you can explore the bustling market of Nepalgunj. Overnight at hotel. In the morning, you take a 35-minute flight to Juphal. 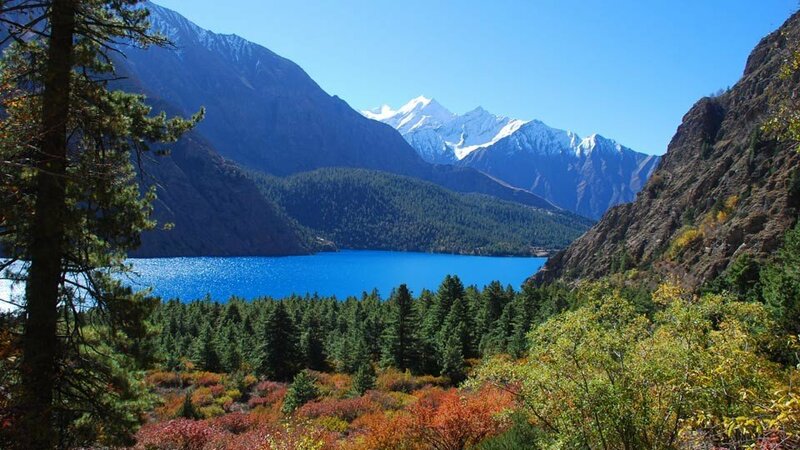 Then you start the short walk from Juphal to Dunai, the headquarters of Dolpa District. Walk downhill through the meadows following the Trail of Thuli Bheri River to reach Suligad Ghat, the junction of Thuli Bheri River and Suli Gad. Continue to trek on a gradual path alongside the Thuli Bheri River to reach Dunai. Overnight at tented camp. Today’s trail ascends slowly as you trek alongside Thuli Bheri River. The trail is narrow at first but later widens into lush forests and meadows. You continue to trek alongside Thuli Bheri River through some cluster of settlements until you reach Tarakot. In the evening, you can visit Lam Gompa situated below the village of Tarakot. Overnight at tented camp. You start trekking to Musikhola by walking downhill to follow the Thuli Bheri River. The trail ascends through the terraced fields to reach Laisicap, where you can visit Chhedhul Gompa before heading on to the small settlement of Musikhola following the trails of Bharbung Khola. Overnight at tented camp. Today’s journey exposes you to diverse social life and hardness of the people. You walk through the narrow gorge and later make a steep ascent on the riverbed of Bharbung Khola before making a small descend to Kakkotgaon. From here, you get an amazing view of Puta Himal and Dhaulagiri ranges. Overnight at tented camp. Follow the ascending trail alongside Bharbung Khola to reach Pimring village. You trek through the riverbed, yak pastures, and alpine forest while enjoying the clear views of Dhaulagiri I (8167m), Dhaulagiri II (7751m), and Putha Hiunchuli (7246m). You can visit the local temple as you stroll around the village in the evening. Overnight at tented camp. You continue to walk up and down alongside Bharbun Khola until you reach Langhar. Then crossing the bridge, you follow Mukut Khola until you reach Mukutgaon. There is hardly any vegetation except a few bushes as this region resembles the desert landscape. Mukotgaon is the last habitation in the valley and is situated right below Dhaulagiri II (7751m). Overnight at tented camp. 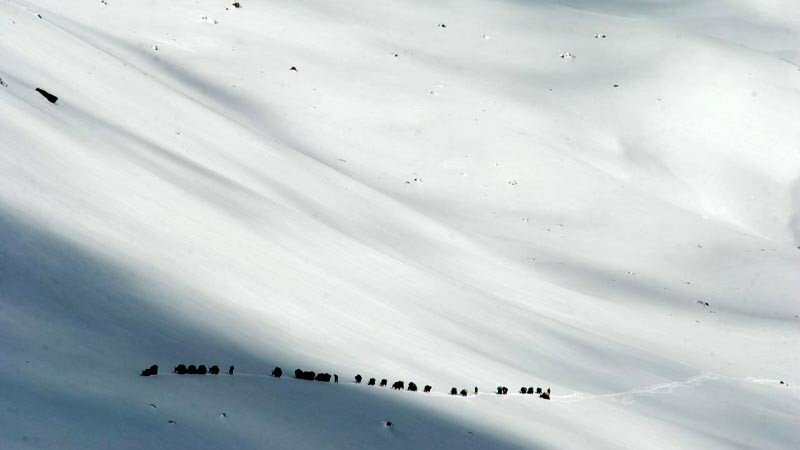 Today you walk through yak pastures on rocky terrain to arrive in Yak Kharka. Follow the faint trail over the rocky terrain and at a steady pace trek through the grazing area whilst enjoying the 360 degree view of the surrounding mountains. Crossing several streams and sometimes walking on the glacial moraine, you arrive in Yak Kharka. Overnight at tented camp. 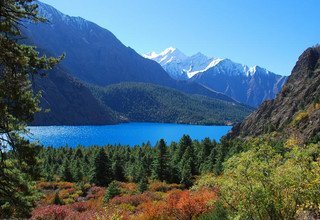 Follow the narrow trail on a rocky ridge opening into yak pasturelands and small glacial lakes. As you trek, you will get amazing views of various snow-capped mountains, including the Dhaulagiri range. Make a steep climb on the riverbed of Thoson Khola to finally arrive in Nulung Sumde. Overnight at tented camp. Day 11: Trek from Nulung Sumde to Niwas High Camp (5000 m). You have a short day today as you will only be trekking for a couple of hours to reach Niwas High Camp. Ascending alongside a small stream on a rocky trail, you reach Niwas High Camp. Get a good rest as it is necessary to be physically and mentally fit as you will be crossing two high passes the following day. Overnight at tented camp. Day 12: Trek from Niwas High Camp — Niwas La Pass (5120m) — Jungben La Pass (5550m) - Ghaldan Ghuldun (4247 m). Today is the most challenging part of the trek. 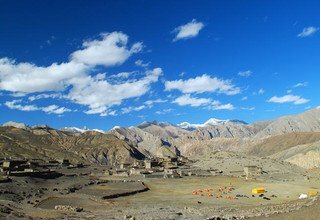 You will be trekking through a remote region of the stark and fantastic Himalayan region. You start with making a steep ascend towards Niwas La (5120m), and as you descend from the pass, you leave Dolpo behind and enter Annapurna region. The trek to the second pass, Jungben La (5550m), can be tricky as it can be extremely windy and cold. 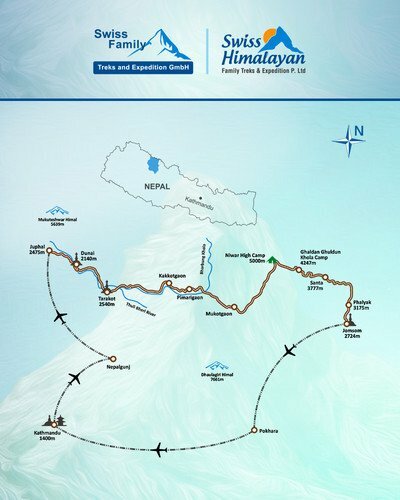 These passes provide great views of the Dolpo region along with an amazing vista of the Annapurna and Dhaulagiri ranges. Afterward, you descend alongside Lhanhimar Khola to reach Ghaldan Ghuldun. Overnight at tented camp. 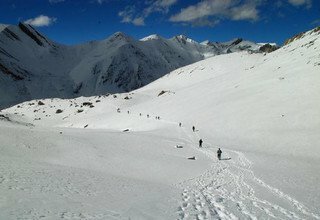 Day 13: Trek from Ghaldang Ghuldung — Santa (3777 m). The trail takes you on a steep route to meet Kyalunpa Khola. Cross the river on a suspension bridge and trek alongside its gorge to reach Jhyanse. You then cross a beautiful waterfall as you continue to trek through the meadows to reach the village of Santa. You might spot a few blue sheep on this territory. Overnight at tented camp. You climb the hill behind Santa and spend most of the day making a high ascend. Walk across nine ridges, cross Bhima Lojun La (4460m), and then descend to the Kali Gandaki valley through a quite path along the forest to reach the large village of Phalyak. Overnight at tented camp. 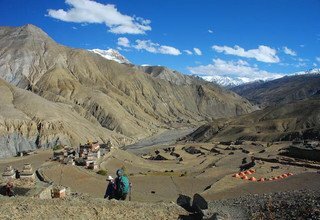 Climb the 400m ridge above Phalyak and head south on the sandy trail towards Jomsom. 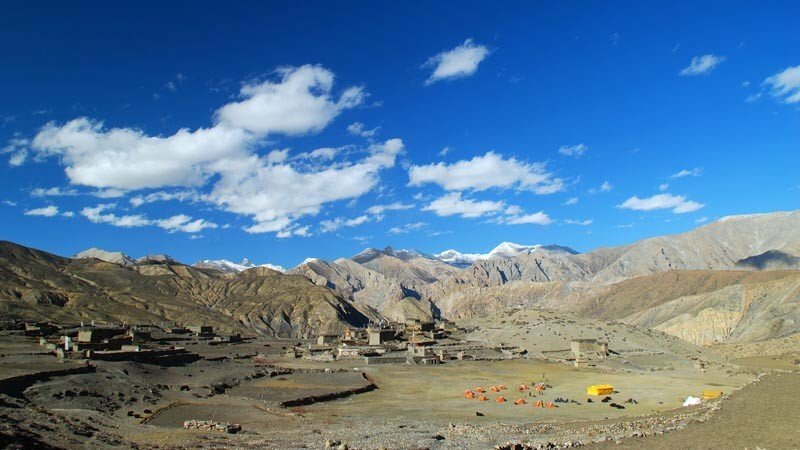 Jomsom is the district headquarters of Mustang and is known mostly for its strong winds. The arrival in Jomsom marks the end of your trekking journey. Overnight at tented camp. The flight from Jomsom to Pokhara provides you the views of Dhaulagiri and Annapurna mountain ranges along with the deep gorge of Kali Gandaki River. From Pokhara, you take a short 25-minute flight back to Kathmandu. In the evening, you can go shopping or enjoy the rock bars and pubs in Thamel. Overnight at a 3-star hotel in Kathmandu. The 17-day trip comes to an end. After a fulfilling breakfast at the hotel, our company representative will drop you at the airport 3 hours before the flight schedule. * 4 nights accommodation with breakfast at 3*** hotel in Kathmandu and Standard hotel in Nepalgunj. * Annapurna Consevation Area Permit. * Domestic flight ticket Pokhara/Jomsom/Juphal/Nepalganj/KTM and Domestic airport tax. * Tips for guide, porters, driver..